The wheel bearings form a very important part of the trailer. This is because they are needed to support the weight of the trailer. They ensure that the wheels turn. When they are maintained properly, they ensure that the wheels are able to spin freely. This happens without any kind of excessive friction on the axle of the trailer. When neglected, the wheel bearing may leak and deteriorate. Foreign objects such as dirt can actually contaminate bearings and this may lead to the assembly breakdown. In such a case, it is very easy for the axle and the wheel to detach. So, how often should you grease travel trailer wheel bearings? Generally speaking, you need to inspect and grease your travel trailer wheel bearings once a year or every 10,000 miles, whichever comes first. It is recommended that the wheel bearings be inspected and then greased at least once in every season. Another recommendation is one greasing after every 10,000 miles covered. However, the smaller trailers that have smaller wheels will need repacking after 2,000 miles. When the tires are small, it means that the wheels tend to spin faster and this stresses the bearings. You can determine how often you need to grease depending on how you use the trailer and the places you have been to. The video above courtesy of DnSAdventures gives clear and easy to follow instructions on greasing your travel trailer wheel bearings. Usually, greasing is charged per axle by professional mechanics. However, this is something that can be done at home at a much lesser cost. You will need to know the basics of the greasing process and buy all the parts needed. You should know the basic mechanical aptitudes to be able to do it right. You will need a wheel jack, rags, a hammer, torque wrench, and high-temperature grease. You can also consider using a bearing packer. This will usually give a rather clean job, but it is not necessary. Wheel bearings have not changed even with the passage of time. Greasing is not a hard task either. However, before you make it a DIY project, you should have with you a service manual for the trailer. The manual should have the instructions that need to be followed when you are greasing. You need to ensure that your wheels are torqued properly. Make sure that you have the right kind of trailer jack. To do it well, ensure that tires located on the opposing side are jacked. This ensures safety since you have to work under the trailer. In case you have a trailer that may have been exposed to very heavy loads or has had the axles covered by water as you tow through it or has been off-road, you need to maintain it. When you have been in extreme situations, you should check the trailer wheel bearings as soon as possible to avoid issues in the future. You need to appreciate that not even a good seal can withstand water, especially when it keeps on exerting pressure. When you happen to drive through water, you should get the bearings repacked after cleaning, especially if they can be serviced. For the factory-installed ones, you need to stay alert to note when there is any premature failure. There are manufacturers who do not grease the bearings before they take the vehicle to the dealers. It is important to test your wheel bearings to find out whether there is excessive friction. To do this, you only need to touch the tires once you have used it. When the surface of the tire is hot, then it shows that there is a possibility of poor lubrication. Wheel bearings hold the wheels in place and they are critical. It is important to ensure that the bearings are in good shape and that they serve the purpose they are meant for well. Wheel bearings are not complicated at all and they are usually created from steel. They are created to withstand up to 100,000 miles or even more especially when they are cared for properly. It is the bearings that hold your vehicle’s weight. So as to function well, they should be perfect at all times. They need a lot of grease for lubrication and protection. A seal is used so as to ensure that the grease stays in place. The seal is also needed so as to protect from dirt and water. If the seal leaks, then you will have serious issues. This is because your grease will be contaminated. It will lead to the overheating of the bearings and ultimately they will surely fail. You will know that there is trouble from the noise that will come from the wheels. The noise is often unusual. You could notice a cyclic, rumbling, growling, or even chirping sound. This noise may get louder in some speeds, while at others, it may disappear altogether. When you notice the noise, do not get the trailer on the road. Have a professional inspect your bearings. This is often done by lifting the trailer and then checking the wheels. Some of the assemblies are usually factory sealed. This means that you cannot service them, but they can be replaced. There are yet others that are not sealed and so they can be serviced according to a schedule. In most cases, the bearings need to be removed for cleaning and inspection. If they appear to be in perfect shape, they can be re-installed. However, if in bad shape, then they have to be replaced. They can be packed in grease and then another seal can be installed. If you happen to own a trailer that has a wheel bearing assembly that is factory sealed, then you will need to replace the whole assembly when any issue arises. The parts can be quite costly, but the best thing is they usually last up to 150,000 miles when the seal remains uncompromised. When you have wheel bearings that are not factory sealed, then the recommended service interval stands at about 30,000 miles. If you are a trailer owner, then you should always remember the wheel bearings. They may need service more often than other kinds of vehicles. Do not allow the bearings to be in a bad condition or rust. Assess the climatic conditions surrounding you and stay alert to any changes in how the trailer runs and then take the necessary precautions. In some cases, the wheel bearings can actually fail. The wheel can fall off your trailer and this can be quite detrimental. To avoid this, it is important to find out as much as you can about your trailer’s bearings. Find out if it is possible to get them serviced and the recommended duration. It is important to look out for the early warning signs, especially after you have been in extreme conditions. The last thing anybody wants is to be stranded on the road with a trailer that has been disabled. Before you start out, you should take time to check the wheel bearings of the trailer as well as the braking system. The bearings are usually neglected because they are not visible. A damaged, worn, or loose bearing is the main reason why the brakes may fail to grab. So as to maintain the trailer, then you have to keep checking the bearings regularly. For this, you will have to jack the trailer to secure it. You need to check your wheels for looseness. Side to side looseness can be serious. The wheel should have very little room to play. This should be around 1/8 of an inch or even less. If you notice a spin that is wobbly or loose, then you should get the bearings serviced and then replaced. You should do a noise check too. This can be done by asking someone to listen from the curbside and the driver’s side as you tow past at around 25mph. They should be keen on clicking, grinding, squeaks, or other sounds that may be emanating from the wheels. If there is any kind of noise, then you will have to check if there is a bad bearing from any of the bearings that need some lubrication. Checking for heat: you should then tow your trailer for a small distance. This should be around 5 to 10 miles at normal speeds. Park it and then touch the wheel hubs. If you feel that it is too hot to hold, then you may be in need of a replacement or greasing. The bearing could be bad and may need to be replaced or it may need some greasing. It could also be because the bearing does not have enough room. You should never use different kinds of grease thickeners at the same time. Do not mix them. Axles use a thickener, that is, lithium complex. When you mix the grease with polyuria soap, clay, calcium, or barium, there may be adverse effects. The grease may actually harden or separate. 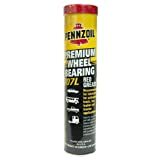 It can also become acidic, thereby, posing damage and other hazards to your bearings.